That dreaded dust... the inevitable consequence of sanding away those old layers of dirt, paint and sealants from your wooden floor. If the prospec t of a dusty atmosphere - or lingering coats of dust - is putting you off arranging a much needed restoration for your wooden floors, then let us set your minds to rest. A modern floor sander has dust capturing bags to reduce the amount of dust released into the air. Our regular floor restoration service does minimise this dust - although a small a mount of the dust remains and will settle down 4 - 8 hours after the completion of the service. Corners and awkward areas have to be finished by hand - releasing more dust. This amount of dust is invisible to the human eye and is usually removed when the floors are next maintained: swept, vacuumed and cleaned. If you need to have a more immediate dustfree environment, we have the solution. Our 100% dust fee floor sanding service is available for areas of floor restoration larger than 30 sq. metres. Our innovative solution is attached to our sanders: it uses a powerful extraction unit with two-step cyclonic course and HEPA separation filters. 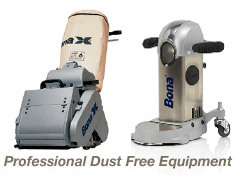 All this provides cleaner and faster sanding, with no dust escaping into the working environment. A beautiful new surface lies in waiting. So call us today for your free assessment. We’ll give you the best advice for the needs of your particular floor.